Industrial design determines a products form, usability, ergonomics, aesthetics and often branding. Take Apple, for example. You can look at almost any Apple product and immediately identity it as such (even without the logo) through its industrial design. In comparison, take something like a Dell, remove the logo, and you’d be hard pressed to identify it as a Dell computer unless you were very familiar with the brand. How Does Industrial Design influence Sales? All products brought to market are designed by industrial designers, some “designs” are nothing more than selecting a standard size enclosure and fitting the components inside (e.g. a simple network switch). A lot of cheap imported products have very little design: they are engineered to meet a price point and obtain the minimum required certifications (e.g. UL). Compare the three dimmers below. The one of the left is obviously built to be cheap. The center one is more aesthetically pleasing (and practical, due to its width). 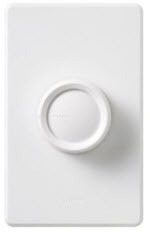 The Lutron Maestro one on the right is a much higher-end design and is designed to match other products in the Maestro line. 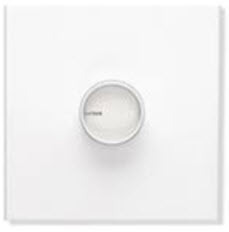 All three provide the same basic function: dimming a light, but he Lutron product has LED’s to indicate the dimming level and a flush finish. Ultimately, unless you’re shopping for the cheapest product, the design will determine which one you buy, given equal functionality. Many people will buy Apple, because they love the design of the products. In a previous job, I had a MacBook Pro that ran nothing but Windows, because our CEO loved apple products, so everyone should have them. This is a somewhat subjective are, so my opinions may not match yours, but hopefully you’ll take away the key points. I wanted to like the Boxee Box. I’m a cord cutter, so I get all my content over the air or through online sources. I had the opportunity to borrow one and decided not to buy it. In my opinion, Boxee made several bad decisions with their industrial design, which ultimately caused me not to buy one. First the shape and the size. While some people may think the design is cool, cool doesn’t win you any prizes (or customers) when it has to be mounted in rack. Like many home theater enthusiast, all my equipment is rack mounted. My rack happens to be in the basement. Given this, I want stuff that I can rack mount. If I can’t rack mount it, I want it take up as little space as possible (especially vertical space) and have the option to sequence my components as needed (generally related to heat dissipation and airflow). The Boxee’s shape means I can’t put anything on top of it, so it has to be on a shelf or at the top of a stack of components (when not rack mounting). The height of the box is 4.5” which is over 2.5U high. This means I’m losing at least 3U to be able to rack mount it. Compare this with similar devices like AppleTV and Roku. These are comparative devices, yet a fraction of the size (and price) and have a sensible form factor. At one of my consulting client’s we recently installed Sharp 80” TV’s in all the meeting rooms. Velcro’d to the back of every one is an Apple TV. (I have the same in my bedroom and have many friends who’ve done the same at their house.) Wall mounted behind each one is a MacMini. There’s no way a Boxee box could be put behind someone’s wall mounted TV without an ugly articulated mount and a big gap between the wall and the TV. That’s gonna cost me sales. I recently listened to an interview with Boxee founder, Avner Ronen. When discussing the shape he said they spent a lot on the shape of the box. In my opinion, not a smart move for a start-up in a crowded market. That shape also translates into higher manufacturing costs and we see that in the cost of the box. The current street price of the Boxee is around $179, which is almost double that of the AppleTV and top-end Roku. Secondly, the remote. This has several design/functional issues. A lot of people watch TV in darkened or dimly lit rooms, so it’s pretty important that any remote control can be used under such lighting conditions. The buttons are not backlit and the labels on the keys are gray on black. Who could possibly imagine this to be a good design for use in a frequently darkened room? I accept that backlighting has costs and battery life issues, but it’s a mistake not including it, especially with a full keyboard. Some of these could be combined into a 4-way rocker if less were desired. But the biggest problem with the Boxee remote is the physical buttons. They are in the center of the remote and there is no way to feel which is which. So, if you can’t read the type on the buttons because of the lack of backlighting and/or poor contrast, you’ve no idea which the top and which is the bottom. The only tactile indication about which way is up, is the raised logo. So this means I have moved my fingers/thumb to end of the remote to determine orientation and then back to the buttons I’m looking for. 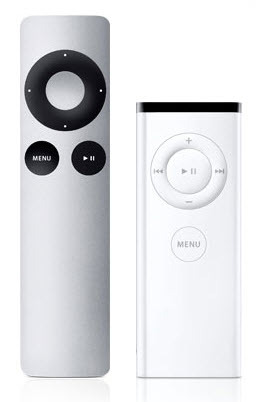 Compare this with the AppleTV remote, which has the exact same number of buttons. There’s no question about which way is up, as the buttons are at the top. I simply feel for the buttons and use them: none of this looking for an orientation mark and then navigating to the buttons from there. Even in a well-lit environment, this is still inconvenient, as you have to look at the remote (or go through this near-braille experience) to use it. On my most-used remotes, I don’t even have to look at them to use them. The other big problem I with the remote is the use of RF. Don’t get me wrong, I love RF remotes. I currently use Logitech Harmony IR remotes and am in the process of replacing them with URC MX-780’s and an MSC-400 controller. If the only device you use is the Boxee, that’s great, but let’s face it, most of us have more devices and remotes than we’d like to have, so we switch to some kind of universal remotes. With the Boxee, I’m hosed. The box does have very limited, unsupported IR functionality if you buy right kind of WMC receiver (now I’m at $200+), but it’s nowhere near good enough for prime time. (There are plenty of threads about the poor IR and dissatisfaction with support for this on various internet forums.) Even though I use IR remotes right now, none of the equipment (other than the TV or speakers) is in the rooms where I watch or listen to media. With IR, I use a repeater system and it works great, but with the Boxee, I have to use their remote. Another reason why I won’t buy one. What’s really ironic about the Boxee, is that most of the flaws have nothing to do with cost saving: on the contrary, they have added to the cost of the product. OK, enough about Boxee. I ran out of network ports in my house, so decided to buy a new 24-port, gigabit switch. I don’t need anything fancy, and specifically want an unmanaged one, because in my experience they tend to stream better than fancy managed switches. As long as it switches (i.e. separates device to device traffic form the rest of the network) and can has a switching engine capable of supporting full rate on all ports simultaneously, I’d be happy…or so I thought. There are two types of network switch small desktop ones that you might place on a desk or mount behind a TV to give a few extra ports. Five and eight port models are common. Typically, when you get to 12 ports an up, switches tend to be rackable. The two candidates I came up with on Amazon were a TRENDnet model for $129 (plus $12 for rack mount ears) and another brand (I forget which) for $115. Unfortunately, the $115 model had no rack mount ears and was an odd height (in terms of U’s), so I ended spending $26 extra for the one with the rack mount ears. Although, it would be easy for a DIYer to fabricate/buy a set of ears and tap holes in the box, the problem is that it's going to invalidate the warranty, so it's not a good idea to take this route. A few years ago, I was upgrading my home theater equipment and decided it was time to invest in some better power protection. I found a great deal on a Belkin unit. It’s hard to see in the picture, but it does have holes for rack mount ears. Unfortunately, it doesn’t ship with them and Belkin don’t supply them, even though their literature mentions them. After several hours research, I read somewhere that Belkin were forced to remove them because of UL certification. So now, I’ve had to spend an extra $30 on a shelf and have lost another U. I can’t remove the feet and have to find a way to secure it to the shelf so that it doesn’t slide when you insert or remove a power cable. All in all a real pain and a reason why I’d never buy it again or recommend anyone else with a rack buy one. Unfirutnately, I didn't rack mount my equipment until I moved house some months later, so I couldn't return it. Price and features don’t always guarantee you sales: I don’t care how cheap a fast, economical car is, I’m not going to buy it if I don’t like the look of it, or it doesn’t fit in my garage. Going for a “way out” design might be really cool, but if it’s going to price the product out the market, or make it unusable its typical environment, you’re going to lose sales. Sometimes, compromises have to be made for price, or other reasons, but spending more money to make a worse product is unforgivable. Next time you buy a product, think carefully about its purpose and environment and make sure there are no design flaws that will jeopardize its use, or worse, make you hate using it. If you’re fortunate enough to be able to return it or replace it, you’re lucky, but being stuck with a product you hate until you can afford to replace it is no fun.